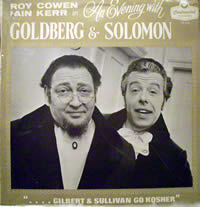 G&S Discography: Goldberg and Solomon's "Gilbert and Sullivan Go Kosher"
Ian Kerr and Roy Cowan toured with an act called "The Best of Goldberg and Solomon" in the late '60s and early '70s. 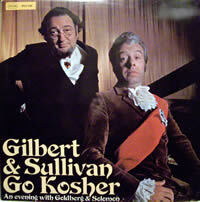 Their premise was that they were performing the Savoy Operas as they would have been written if G&S had been Jewish. Works included Trial by Jewry, M.R.S. Pinafore, Three Little Maids from Schule, The Chandeliers (about a couple of interior decorators; one of the numbers is "Take a Pair of Pizza Pies"), and The Tailors of Poznance; or, The Apprentice Lover Should Never Press His Suit in the Firm's Time. This recording contains extracts from The Tailors of Poznance along with potted versions of M.R.S. Pinafore, Three Little Maids from Schule and The Chandeliers. It is alleged to have been recorded live in a theatre and to be extracts from a full evening's entertainment. In fact it was recorded in the Pye Studios off Edgeware Road in London, before an invited audience. I know, because I was part of the audience, and the various extracts were recorded several times, while our laughter was rehearsed! Sadly, I can't hear my own laughter, but Victor Golding (whom some of you know) was there as well, and his laugh is very distinctive. They recorded some other extracts which were never included on the record, I think Trial by Jewry might have been one. This would have happened about 1970, but my memory is a bit hazy after all this time. In fact, Dan Kravetz reports that Gilbert and Sullivan Go Kosher includes just excerpts from The Tailors of Poznance (Side 1) and The Chandeliers (Side 2), plus a final duet by Cowen and Kerr out of character to the tune of "He is an Englishman." (In other words, there is nothing of Three Little Maids or M.R.S. Pinafore.) Dan imagines that there was an earlier disc, from 1967 or so, that contained this extra material, but details of it have not come to my attention. There are at least two other Goldberg and Solomon albums, comprising the complete scores of The Chandeliers and The Tailors of Poznance respectively. from "The Tailors of Ponzance"
from "The Three Little Maids from Schule"
"Never Mind My Why and Wherefore"
"Take a Pair of Pizza Pies"
as well as "A Pair of Grand Old Jewish Men"
Note: There were obviously two different pressings, as demonstrated by the album covers above, but I have the issue details for only one.